37 C.F.R. 1.610 Content of request for supplemental examination. The request must satisfy all the requirements of 37 CFR 1.605, 1.610 and 1.615, in order for a filing date to be granted. 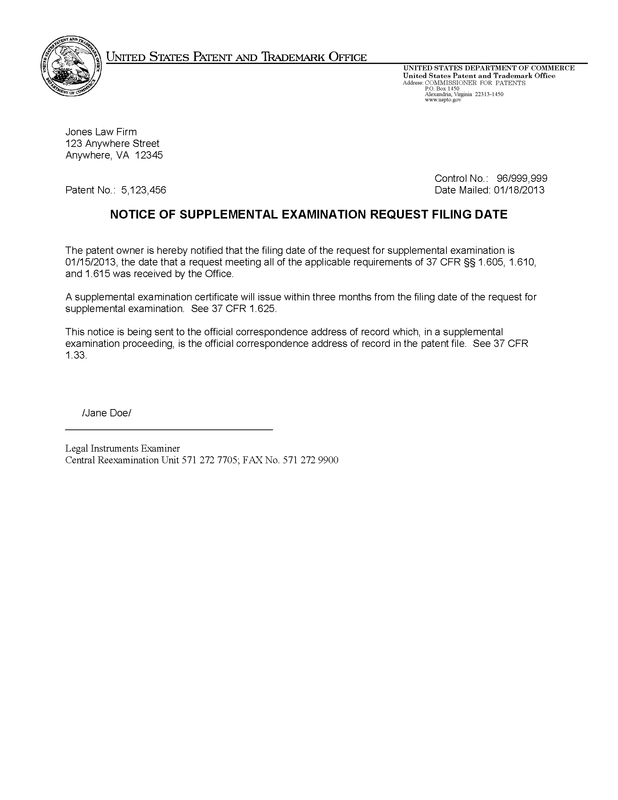 The Central Reexamination Unit will determine if a request for supplemental examination meets these requirements and will be granted a filing date. Even if the request is determined to be defective, the Office has the discretion under 37 CFR 1.610(d) to grant a filing date. However, the Office will not generally grant a filing date to a defective request unless the request contains only minor defects, such as minor formatting defects (e.g., improper margins, etc.). If the request is not granted a filing date, the Office will mail a "Notice of Noncompliant Supplemental Examination Request (37 CFR 1.610(d) )", detailing the defects in the request. See MPEP § 2812.02. If the request is granted a filing date, the Office will mail a "Notice of Supplemental Examination Request Filing Date". The following is a copy of such a notice.